I’ve been a busy bee since going “back to school” and I’ve had little time to spend on this space. It can be overwhelming when I stop to think about everything I want to accomplish, but I’m looking ahead and moving forward and celebrating the small wins along the way. After all, life is made up of a million small moments waiting to be celebrated. They deserve it and so do we. Looking ahead is important, but sometimes though, it’s nice to look back. In this case, on childhood cereals that I can’t believe my mama let me eat. In her defense, she wanted to make me happy, and didn’t know any better back then. That cereal was Cinnamon Toast Crunch. I loved the intense cinnamon flavour and the crunch, but even back then I couldn’t drink the leftover milk it had been soaking in cause it was entirely too sweet. I haven’t had Cinnamon Toast Crunch in years and while my breakfasts consist of oatmeal or porridge in some form 90% of the time, and the days of crispy crunchy cereal are far and few between, I woke up craving that cinnamon crunch a couple of weeks ago. I had seen it in a supermarket flyer during our stay in Canada over the holidays and was plagued with nostalgia that stayed in my sub conscious memory I suppose. 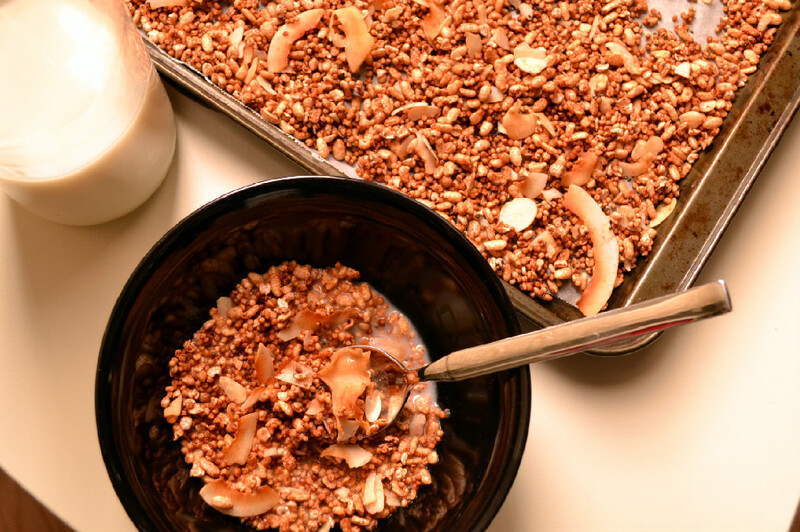 So, here is a health-ified version of that childhood favourite made with puffed whole grains, cinnamon, chia seeds, coconut flakes and shaved almonds and lightly sweetened with pure Canadian maple syrup or brown rice malt. My first batch used 1/4 cup of maple syrup which turned out too sweet for my liking, so I reduced it to 2 tablespoons and it was perfect, I also tried a batch with brown rice malt syrup which isn’t as sweet as maple syrup and that was great as well. Play with it depending on your sweet tooth preferences. Change up the nut, or leave them out all together if you’re allergic to nuts, toss in some flax seeds in place of or in addition to chia seeds and use any combination of puffed grains that you can get your hands on, from brown rice, to amaranth, quinoa, millet, and buckwheat to keep it gluten free or go ahead and use puffed barley, spelt and farro if gluten isn’t an issue for you. Puffed whole grains as the name connotes are puffed versions of the whole grain kernel and are very handy to have around for quick no bake granola bars. Just be sure to read the label when you’re buying them as some are made with flour and water. You want to look for one that lists the whole grain as the only ingredient (i.e. 100% organic brown rice and NOT organic brown rice flour and water). I’ve read mixed opinions about the nutritional value of puffed whole grains depending on whether they’re lightly heated and popped or made by high heat extrusion. The way I see it is that I would never replace whole grains with their puffed varieties entirely, and I would never rely on them as my main source of nutrients. I eat them occassionally and in very moderate quantities, and they are a great way to make homemade cereal and granola bars that are far better than the commercial varieties out there. That said, to kick up the nutritional value of this cereal I added almonds and chia seeds. Almonds are rich in dietary fiber, plant protein, essential fatty acids and many vitamins (vitamin E and B complex vitamins) and minerals (manganese, magnesium, copper, phosphorous, calcium, iron, zinc and potassium). Chia seeds are the super food of the decade. Like almonds, they’re also rich in dietary fiber and omega 3 fatty acids which are great for digestive and heart health. One of the amazing things about this seed is how it puffs and forms a gelatinous outer coating when exposed to liquids. Not only does this make chia seeds a great egg substitute in vegan baking but it also makes them a wonderful natural solution to slowing the metabolism of carbohydrates, thus regulating insulin production and stabilizing blood sugar levels. Chia seeds are also good source of calcium, manganese and phosphorous, essential minerals for healthy bones and teeth. 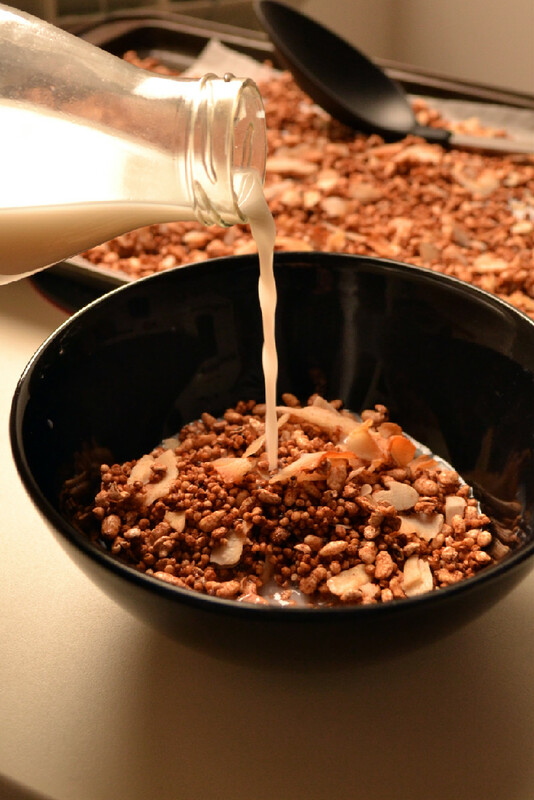 Add puffed grains, coconut, cinnamon, vanilla and almonds to a mixing bowl and mix with your hands to combine. Combine melted coconut oil and maple syrup and pour over puffed grain mixture. Stir to combine well making sure all the mixture is well coated and the cinnamon is well incorporated and hasn’t sunk to the bottom of the bowl. Bake for about 15 minutes, stirring every 5 minutes, until it’s crunchy and crispy. Be careful not to burn it. Since oven temperatures vary, keep a close eye on it as you may need to take it out sooner or leave it in a bit longer. The coconut will start to toast and brown and that will be your indicator that it’s ready. To be sure, you can taste test a puffed grain to make sure it’s crunchy enough before turning the oven off. Stir in chia seeds and once cooled, transfer to a glass jar or airtight container. Serve with your favourite plant milk, with an extra sprinkle of chia seeds for some added goodness or munch on it dry as a snack. This sounds great. Love the sound of “crunch” in there, and the maple & spice of course 🙂 Now you’re really inspiring me to go back to granola making. Thanks Audrey, this one is less granola and more cereal, but its oh so tasty, so it really doesn’t matter what we call it. I can’t wait to see what creative granola concoction you come up with.